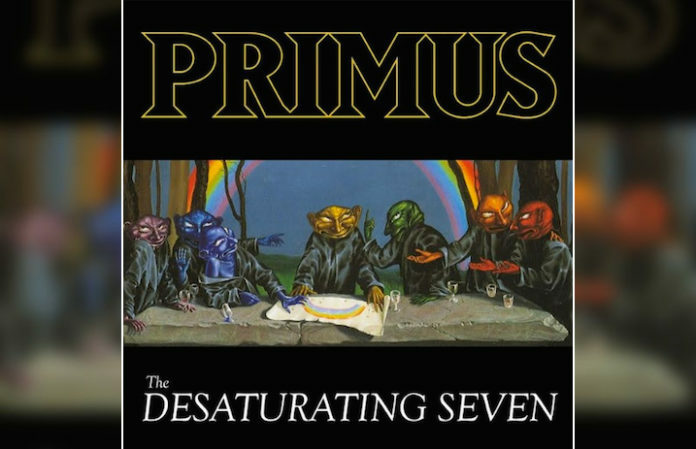 The Desaturing Seven is Primus' first studio album of all new material in six years, following 2011's Green Naugahyde (and 2014's soundtrack re-imagining Primus & The Chocolate Factory With The Fungi Ensemble). Metal Injection reports that the new record will be the band's first since 1995's Tales From The Punchbowl to feature the “classic” Primus lineup of bassist-vocalist Les Claypool with guitarist Larry LaLonde and drummer Tim Alexander. Check out Primus' comeback track “The Seven” right here, and see the band's tour dates after the new song—the band are on the road right now with Clutch and continue their U.S. trek through the end of the year.